For the last few weeks, everyone's been talking about wizards. This is obviously due to the release of the latest installment in the Harry Potter series, but for your Harry Potter and Voldemort, I will raise you two wizards of my own. Their names, equally as famous as the dark lord, and equally as attention grabbing in certain parts of the world, ring out from the lips of football fans the world over. 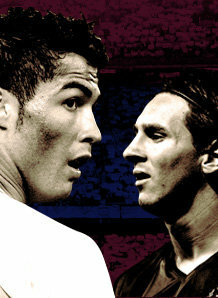 The two magicians of the game I am referring to, of course, are Cristiano Ronaldo and Lionel Messi. The wands aren't necessary for these men though, their magic comes from their feet, that seem to move effortlessly, to create some of the worlds most breathtaking highlights. Even SportsCenter anchors don't butcher their names anymore, as they have become regulars in the minds of all sports fans for their sheer athleticism and game changing plays. The similarities both link them to each other, and set them apart from everyone else. They will forever be linked, as they are both young men at the top of their games in the same league in the world, but they are far from the same. Cristiano Ronaldo, the Real Madrid winger/striker/all around playmaker, and Jose Mourinho's ace in the hole. A true dynamo with the ball, he is known for his pace on either flank, power on the ball, and a vicious step over that leaves defenders guessing. He got his start as a teenager in the Sporting CP team of the Portuguese League, but as soon as he started playing he was catching the eye of suitors all over the world. All the big clubs chased after his signature, and Liverpool manager (at the time) Gerard Houllier made a move to sign the Portuguese Pretty Boy, but was rebuffed by his ownership, as the teenagers wage demands were too high. He knew he was good, and wasn't very modest in letting people know, even at a young age. After just 25 appearances, and 6 goals at Sporting, Cristiano made the move to England. It was a match made in heaven (or hell for opposing fans) and Alex Ferguson had gotten a gem of a player, someone who would dominate for his 7 years at the club (2003-2009). He would be given the famed #7 jersey and thus CR7 was born. Despite a seemingly perfect fit with his new club, the allure of Madrid finally came calling in 2009, and Cristiano, after somewhat of a falling out with his teammate and good friend Wayne Rooney he demanded a transfer to the Iberian giants. 82 million euros later, and Ronaldo was on a jet out of Manchester, to play for the biggest team in the world, The Galacticos. When he left he took with him an astonishing 84 goals in 196 games, and Manchester United just hasn't shown the same attacking prowess since he's moved on. That stunning ability to create goals was carried in the gifted Nike sponsored feet of Ronaldo, and he carried his incredible form and ability to the Spanish side. Since arriving in 2009 he has been on a tear, scoring an unbelievable 42 goals in 43 games. Even upon writing it again, my jaw drops at this stat. That is the equivalent of LeBron James averaging 40 a game, Alexander Ovechkin scoring 80 goals in a season, or Albert Pujols hitting 160 home runs in a season. His pace, power, aerial ability, skill with the ball, and nose for goal have set him on a pedestal above 99% of professional footballers, and indeed professional athletes in general. He is in the company of a select few on the field, even if he leaves something to be desired off of it. Watch for Ronaldo to dominate for years to come, and when his dazzling career comes to an end, he will be remembered as one of the best ever. Lionel Messi is the anti-ronaldo. For all the flashiness, cockiness, and lack of loyalty Ronaldo shows, Messi does the opposite. He avoids the spotlight like an Alcatraz escapee, and instead chooses to do his talking on the field. Incredibly skilled, quicker than a rabbit, and able to read the game like a novel, Messi possesses an ability to take over a game despite being just five foot seven. Defenders have nightmares featuring 1v1's with the Argentine wiz kid, and comparisons with Diego Maradona, one of if not thee greatest player to ever grace the pitch, are not far off. Through assists, goals, and unselfish runs he makes the game easy for those around him, and incredibly difficult for those against him and that's what makes him so great. Unlike his counterpart, Messi has been a loyal man, loyal to the club that made him, Barcelona. At just 13 years of age, the young Messi-haired kid (too tempting) from Argentina moved across the pond to join the famed Barcelona academy and quickly was noticed by his coaches. At 17 he made his full professional debut and has never looked back. He doesn't just score goals, he creates moments, moments that will be talked about for not days but years, and that is the mark of someone who is truly special. He has scored 103 goals in 156 appearances for the club, and is still just 23 years of age, meaning there is (incredibly) still upside. He receives all the accolades, all the compliments, and all the dare I worship that any man could imagine, and takes it in stride, never drawing attention to himself on the field or off of it. While Ronaldo lays on the floor as if shot in the knee by a sniper, Messi gets hacked down by defenders doing anything they can to stop him, and hops back up smiling, because in his head, he knows he gets to embarrass them again in a few minutes. For him, this is getting fouled in the same way a basketball player would get fouled, and trust me, he will take the mans number, and "dunk" on him minutes later. His demeanor, despite being at the top of his game is refreshing, and his skills on the field are just as impressive. Messi does it the right way, and along with his foil Ronaldo, is truly one of the greatest performers to watch in the modern era. We are blessed to be able to watch either of these players, and if you get the chance to see them you won't be disappointed. If their artistry with the ball at their feet doesn't inspire you, then their sheer goal scoring ability should. They do it in different ways, but the outcome is the same, and Ronaldo and Messi will go down as the faces of our generation, and will be remembered for making soccer more well known globally, and for putting the Joga Bonito back int he sport. One of these players will be the player of the season in La Liga, who would you pick? You can't go wrong with either, they truly personify the beautiful game. Samba on boys, Samba on.